We want to welcome Eileen from Oxymagic of Carolinas. She is another great carpet cleaning customer in Charlotte, North Carolina that signed up a little over a month ago. 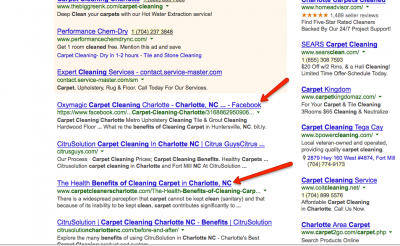 Check out these great results with their Facebook page ranking #1 in Google for a carpet cleaning search. For all your carpet cleaning marketing needs in North Carolina, give Ron a call at 602-418-0552 or fill out the form on this page.